Sometimes I throw together vignettes I'm happy with in no time flat, sometimes I struggle, and arrange and re-arrange and never seem to get it right. 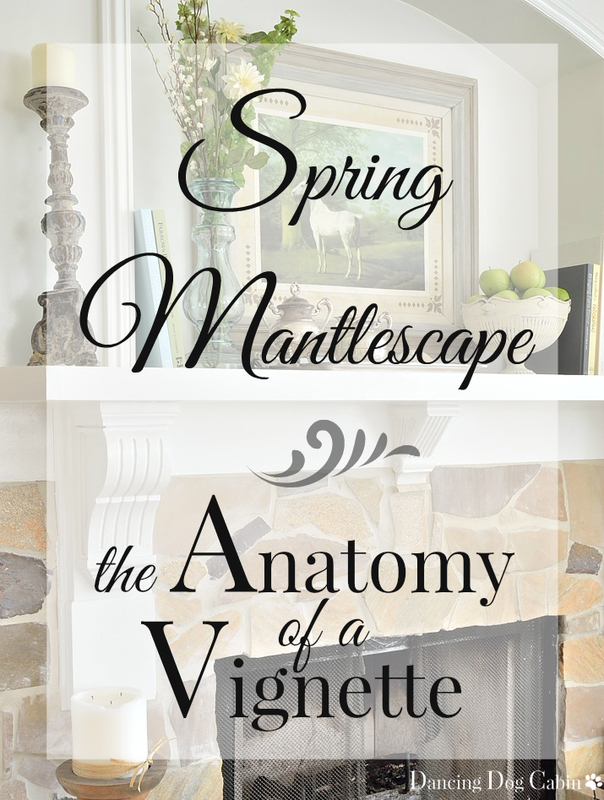 My spring mantlescape came together fairly quickly, and I'm pretty happy with it, so I thought I would present it as a kind of 'anatomy' lesson. 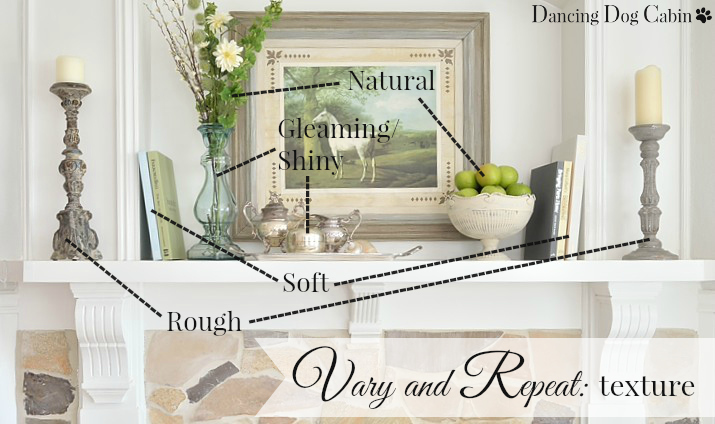 Here is my take on the important elements of a good vignette, which is generally composed of a pleasing balance of variable and repeated elements and motifs. 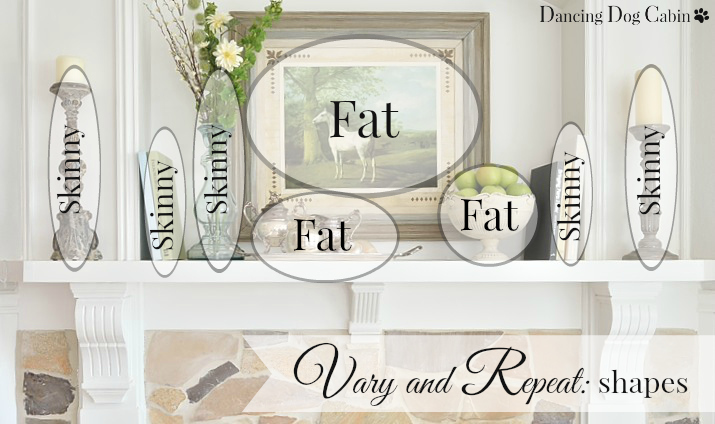 Striking the right balance between 'skinny' and 'fat' objects and groups makes all the difference. 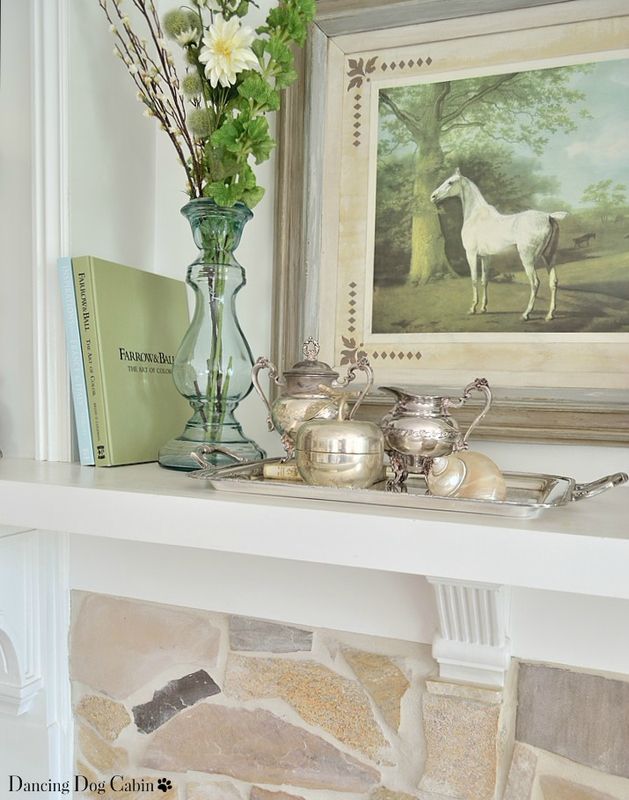 The 'fat' shapes of the horse picture, metal pedestal bowl full of apples, and collection of silver objects juxtapose nicely with the 'skinny' shapes of the books, vase, and candle holders. Repetition of these shapes achieves visual balance. Varying the height of objects is another important way of adding visual interest; repeating objects with the same height, and using a degree of symmetry keeps things balanced and visually satisfying. The two candle holders on either side of the niche are virtually the same size, once I added the taller candle to the shorter one on the right. This doesn't mean that you couldn't flank this entire arrangement with two objects of differing heights; it all depends on the ultimate look that you are trying to achieve. In general, the more symmetry you add to a vignette, the more formal it becomes. 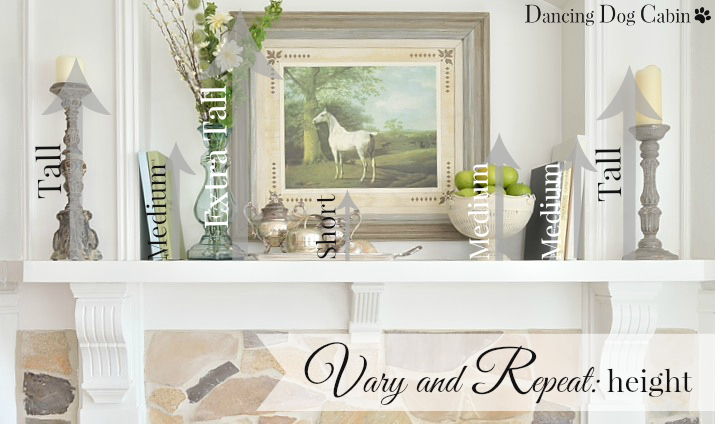 For instance, if I used the exact same candle holder on each side of the niche, and the exact same glass vase and floral arrangement on either side of the horse picture, the whole thing would be much more formal in effect. Digressing a little from the subject of height, the degree of formality can be adjusted in other ways as well; using multiples of the same shapes, using more silver-plate objects, and eliminating the books and the bowl of fruit, both of which add a fun, spontaneous touch to the whole arrangement, would amp up the formality here. In this case, I didn't want anything too stiff and matchy. 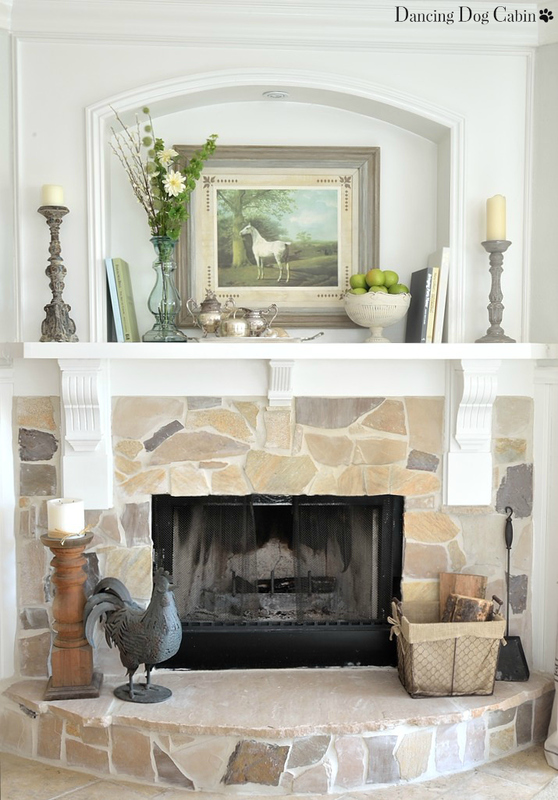 Varying tall, medium, and short objects produced a more casual, informal effect (as did using rustic finishes and unexpected objects such as the candle holders, books, and apples). The glass vase with its collection of florals adds a bit of extra drama to the entire scene, which is needed for this deep, substantial wall niche. Varying and repeating patterns and motifs is another way of creating a vignette that is interesting and dynamic. The curvy ornateness of the candle holders is repeated again in the equally voluptuous glass vase, but the materials and finishes of each object are different. 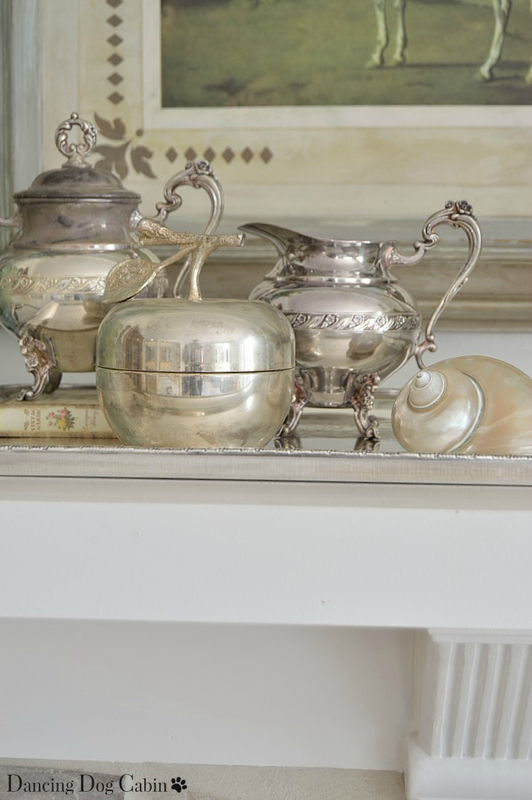 The collection of round, green apples in the white metal bowl echos the adjacent collection of short, squat silver objects. The apple motif is literally repeated in the brass apple, which, thanks to its silvery finish, matches it's silver-plate companions very nicely. There are four main colors in this vignette: green, white, putty/gray, and blue. 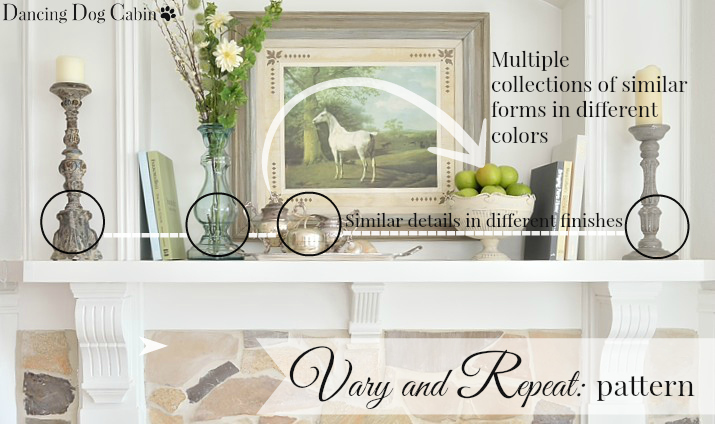 All of these colors are repeated multiple times and can be found in the horse painting, as shown in the diagram below. Again, it's the variety that makes it interesting, and it's just the right amount of sameness and repetition that keeps it cohesive. While there are variations of four colors here, they are all on the soft, neutral side of the spectrum, which allows everyone to play nice together. If the Farrow and Ball book on the left was in a bright Kelly-green color instead of it's soft, faded apple green, it would be visually jarring and look out of place. There are four main textures here: rough, soft, shiny and gleaming, and natural. Again, the variety makes it interesting, and the repetition pulls it all together. 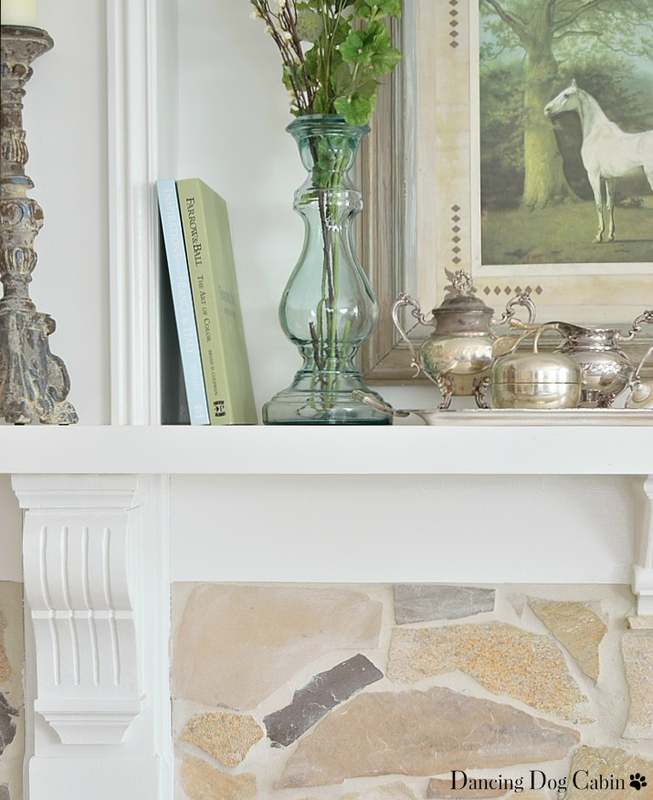 The shiny glass and gleaming silver creates a focal point that catches the eye and adds an elegant touch, while the aged, nubby finish of the candle holders provide a nice contrast--and, incidentally works well with the rough stone of the fireplace below. ....but as I adjust, I'm attempting to achieve the right mix of variation and repetition within each of these five categories (i.e. shape, height, pattern, color, and texture). Adjusting symmetry (as well as the finish and type of each object) more or less determines the level of formality. What a terrific lesson! It looks beautiful, and I so appreciate the time you took to prepare this post. I can't wait to give it a try! Thank you Mimi! I hope you have fun trying it out! What a lovely mantle display. I really like that you used the silver tea service and the bowl of green apples............and what a charming pictures as well. Everything looks beautiful. Thanks for this! I have been stuck on 'balance' as symmetry. Just rearranged a few items and it looks better already. Very well done, clear post. Thanks again! 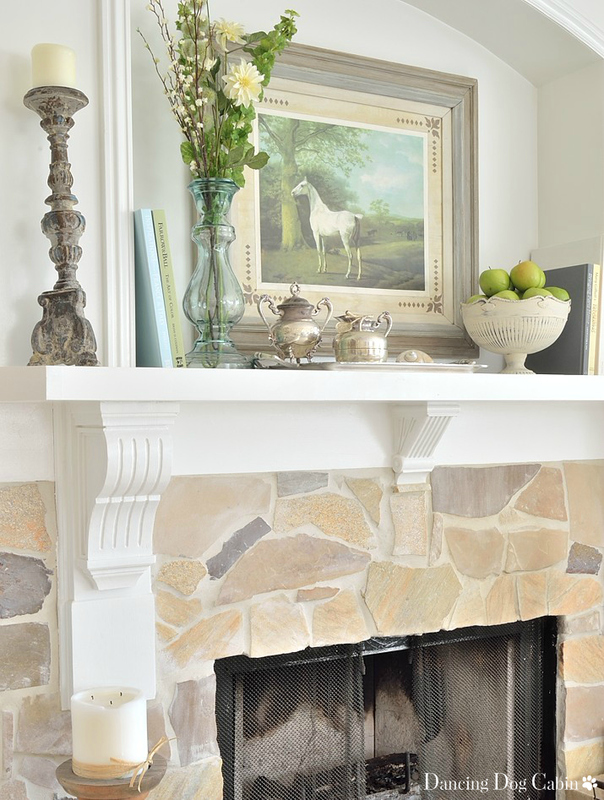 Your mantle is stunning and everything looks perfect! Thank you for the tips, sweet friend. And thank you for sharing with Roses of Inspiration. Hugs! 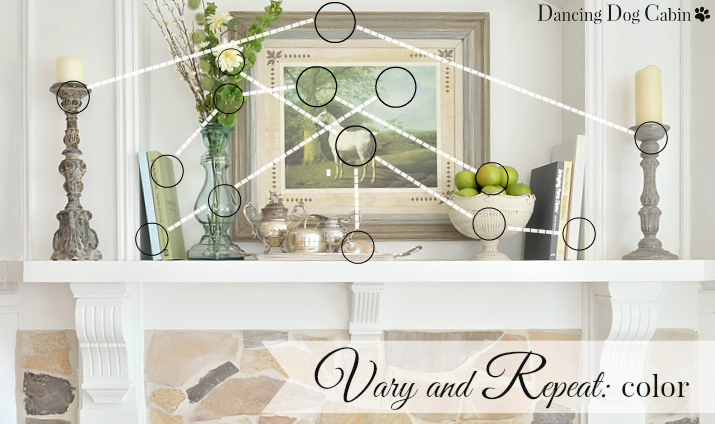 Your post is a wonderful tutorial for those of us who find decorating a mantel a challenge. Thanks you! It's challenging for me too. Great vignette!! I have a very simple display on my mantel right now...after the holidays I needed to pare down! Love that rooster, by the way - he can come live with me! Thanks! I'm sure he'd enjoy wandering around your pretty garden (if he could walk). That's the most fun anatomy lesson I've ever had! Love the way it turned out! 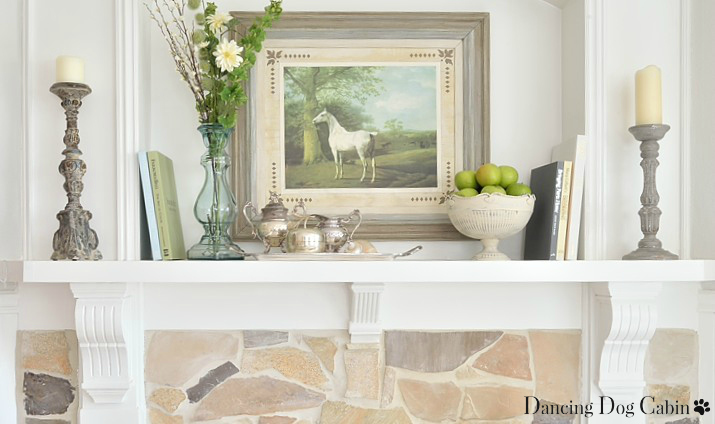 I love the way you decorated your gorgeous mantel! I co-host a blog party on Monday's called Cooking and Crafting with J & J. I would love to have your join us and share this at Julie's Lifestyle. Vignette's are a challenge for me and the way you broke his down is very helpful. Thank you so much! I'm glad this was helpful for you Sandra. As soon as I saw your vignette, I knew it was perfect, I just could not have told you why. Thank you for explaining what it takes to make this perfection. Also, I love your fireplace colors. 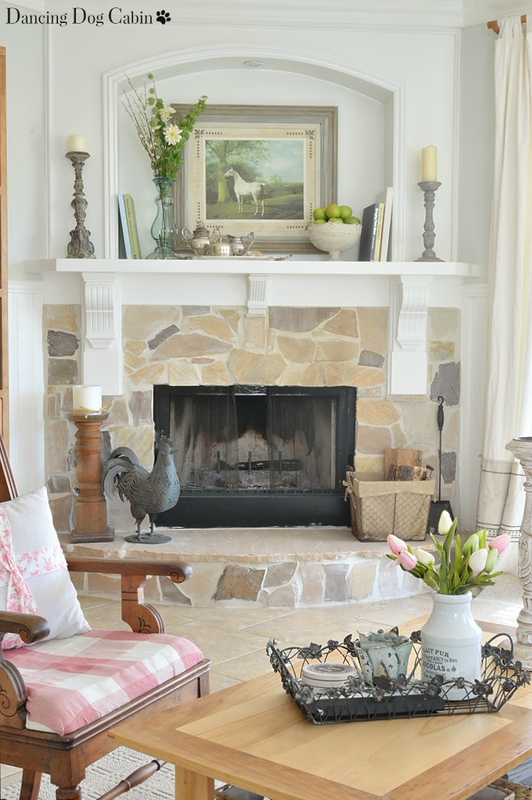 I'm pinning and may borrow your idea for my fireplace remodel. Thanks for all the inspiration. Thank you Mary! Good luck with your fireplace remodel. 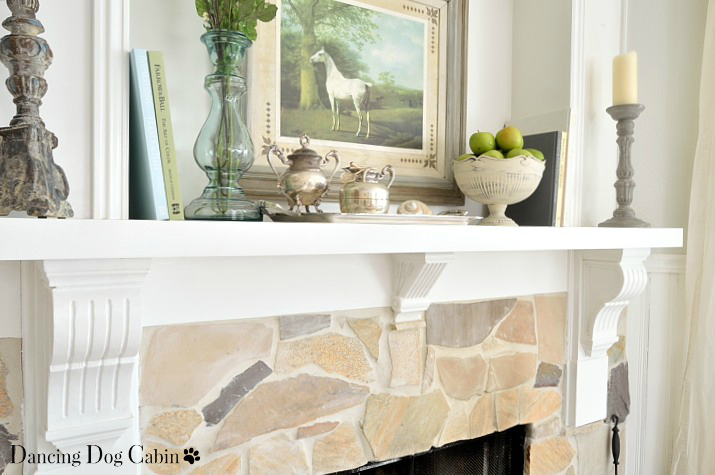 Melissa, your spring mantel is perfection and what a great tutorial! Thank you for sharing @Vintage Charm! 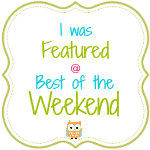 Pinning to our Features and Favorites! 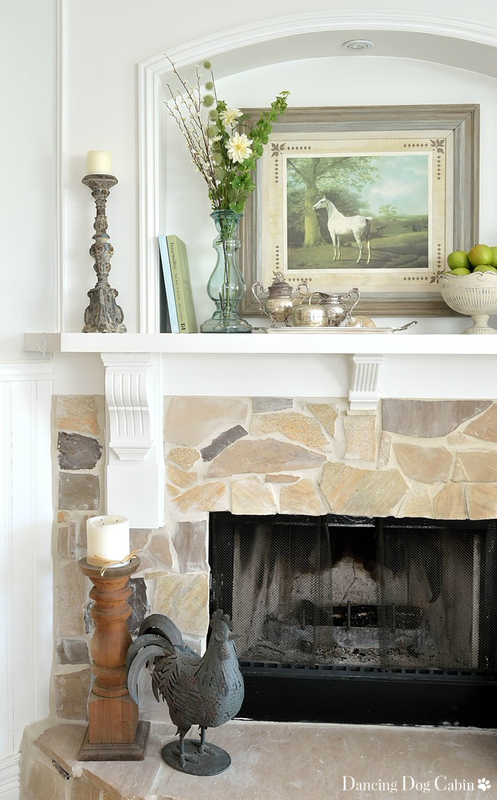 Your mantle is gorgeous! And the breakdown of the elements of a vignette is absolutely perfect. Thanks so much for sharing at Inspiration Thursday!